Pregnancy brings on a host of symptoms, many of which affect the digestive tract. Furthermore, most pregnant women take prenatal vitamins, which can also affect digestive function and exacerbate stomach or intestinal discomfort. If you're taking prenatal vitamins, it's perfectly normal to occasionally find yourself experiencing diarrhea, or loose stools. If you're pregnant and your obstetrician has recommended that you take a prenatal vitamin, you're likely taking something very similar in composition to a regular daily multivitamin, with a few key differences. 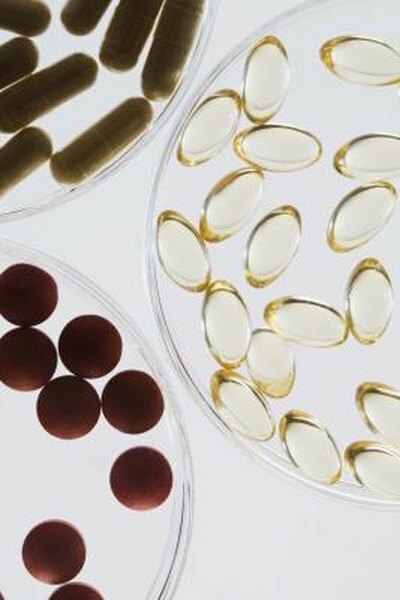 Prenatal vitamins have much more iron than womens' daily vitamins, explain Drs. Michael Roizen and Mehmet Oz in their book "You: Having A Baby." They also contain larger quantities of folic acid, and some may contain more of other vitamins as well, including A, D and C.
The iron in prenatal vitamins serves an important purpose -- you use it to make new red blood cells. During pregnancy, your blood volume increases as much as 50 percent, explains Heidi Murkoff and Sharon Mazel in their book "What To Expect When You're Expecting." Consequently, your iron needs go up, and prenatal vitamins help to provide the additional iron you need. Large quantities of iron taken at once, however, can aggravate the stomach and intestine. Both pregnancy itself -- as a result of high hormone levels -- and extra iron in prenatal vitamins can lead to a host of gastrointestinal symptoms for pregnant women. Nausea is common, as are gas and indigestion. While most pregnant women notice that they're constipated, a few will have diarrhea. Murkoff and Mazel suggest that if you're having diarrhea during pregnancy, you might try changing brands of prenatal vitamins -- sometimes, that can help. If changing brands of vitamin doesn't help reduce your symptoms, there are other ways to help firm your stools naturally. It's important to drink plenty of water to make certain you're replacing the water you lose, note Murkoff and Mazel. Additionally, you can often soothe an upset intestine by using what's called the "BRAT" diet -- bananas, rice, applesauce and toast -- which helps to alleviate discomfort and remove potentially offending components. If your diarrhea is severe, lasts more than a few days, or doesn't respond to changes in your prenatal vitamin or diet, it's important to talk to your obstetrician. You could have a gastrointestinal infection or some other underlying cause of the diarrhea. Particularly since diarrhea means you're not absorbing all the nutrients from your food, it's important to get help in solving the problem as quickly as possible, so that you can return to providing your body -- and your baby's -- with nutrients.